So we fly all the way to California, land of the sun only to be woken to the sounds of dripping on the window seals outside due to the fact that it was raining. OK I accept that May weather in Los Angeles can be unpredictable but come on, if we wanted rain we could have gone to Kent!. Still it wasn’t long before the skies cleared and fortunately we didn’t get wet walking to find somewhere to have breakfast. Unfortunately we couldn’t find anything open in walking distance at 8am on a Sunday morning, so we got in the car and drove along Hollywood Boulevard until we found somewhere open. The cafe provided me with some much needed nourishment; I hadn’t eaten a meal for some 18 hours so I was starting to wither away (I wish). The cheese and ham omelette went down a treat even though it came with a side order of toast, touching the egg. A quick wipe of the plate/omelette, removing the offending breadcrumbs made the food edible for me and it was all washed down with a strong cup of coffee. Tina also had the omelette and but instead asked for a cup of tea, but that was ignored; I guess the American’s just don’t get our love of the British cuppa. 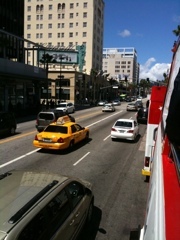 Back to our hotel for a quick brush up (teeth that is) before hitting the Hollywood tourist trail. As the famous Sid Graumann Chinese Theatre was only walking distance from our hotel we headed off towards this attraction, with the intention of booking a tourist bus ride to see the sites of Los Angeles. 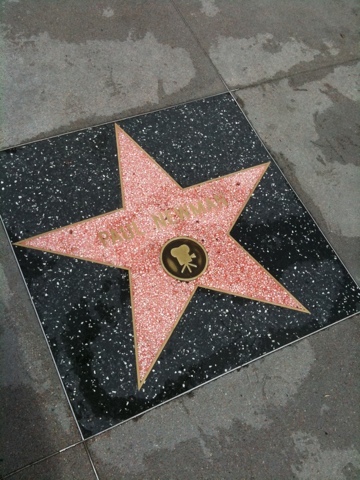 On the way we came across the Walk of the Stars, a number of granite plaques with names of famous show business people inlaid with a sign denoting the area that the were famous for. This row of names extends for the length of the boulevard on both sides of the road and covers pretty much anyone that has been well known in the celebrity stakes (I did notice that there we no so called ‘reality personalities’ to be found, perhaps Hollywood can spot those that wont be around for very long). 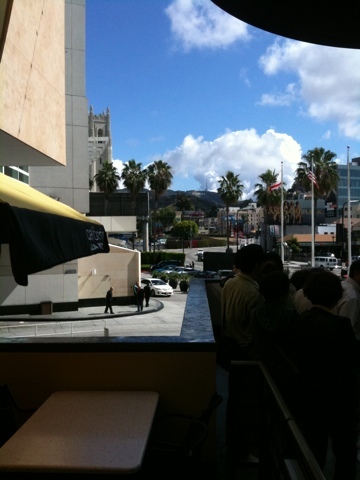 Just before the Chinese Theatre is the famous Kodak Theatre, where the Oscars are held each year. As we walked in there were a number of people taking photos of some stairs leading up to the entrance of the theatre. Not one for missing a photo opportunity I got Tina to stand on the bottom of the stairway and snapped away, oblivious as to why they were famous, having never watched the actual ceremony on TV. Maybe next year I will watch it just to see those stairs and to say…we were there! At the top of the stairs there is a spot that has been created which is an ideal place to take a photo of the Hollywood sign that adorns the hills above the area. Unfortunately it was impossible to get anywhere near it as there was a bus load of Japanese tourists, each taking it in turn to be snapped with the sign in the background. Eventually I did manage to get some shots of Tina; again enduring my request for her to be my foreground interest. 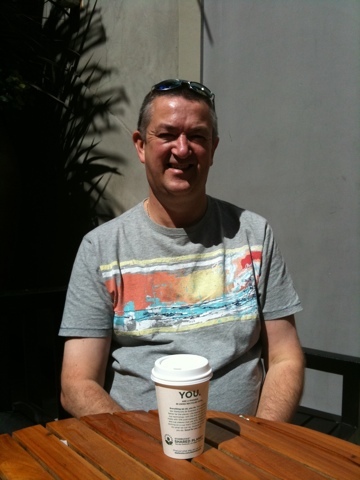 A quick coffee at the adjacent Starbucks before we made our way to the famous Chinese Theatre where you are immediately drawn to the cement paving slabs that have been adorned with movie stars hand and foot prints. 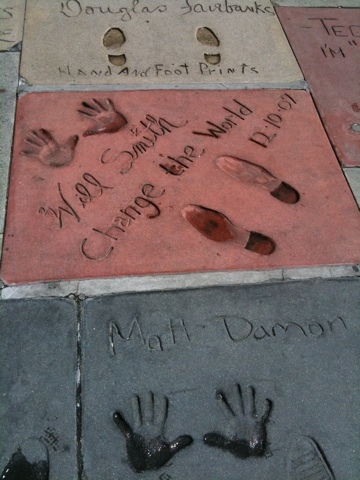 This tradition goes back to the early 1930’s and there are still slabs being made nowadays, with film star Matt Damon being one of them. We then booked tickets for the tour bus which took us through Hollywood, Beverly Hills and Paramount before returning us back the start. The tour had a commentary running between stops which was informative explaining about the various areas and buildings we passed. Both Tina and I remarked on how different Beverly Hills was to Hollywood, clearly you can see why the rich and famous frequent in this part of LA. Rodeo Drive was particularly refined with many of the shops such as Versace and Prada out of our league; the tour guide kept saying that this is where the stars shop but we didn’t see any. We passed the last remaining Hollywood film studios, Paramount which still produces blockbusters as well as hit TV shows, the rest having moved to other locations in Los Angeles. On arriving back at the Chinese Theatre we grabbed some lunch before re-boarding the tour bus to hop a ride to the Farmers Market and The Grove, an upmarket shopping area. By this time we had got a bit sunburnt from the clear blue skies and cool breeze, the rain from this morning a distant memory. We started to walk back towards the hotel but realised the distance was too great so we hopped back on the tour bus. Unfortunately we got on with the wrong bus company but managed to get away without having pay again. We headed back to the hotel room exhausted. After a short siesta, we then drove around looking for somewhere to eat ending up back at the Farmers Market where we chose a small cafe diner called Marmalade, which I had spotted earlier in the day and that was very busy meaning it must have been good. We weren’t disappointed although choice was limited, especially for GF options. I plumped for chicken and mash, whilst Tina had tagliatelle, not before demolishing a plate of corn chips between us. The cost of the meal was quite reasonable too at $60 including the obligatory waitress tip. On leaving the car park we got stung for parking, not realising you had to buy something in the market to get the stay free. With no receipt for the meal we paid the $8 charge and drove back to the hotel where we fell into bed exhausted. Over dinner we discussed what we’d seen during the day and whilst we were impressed by Beverly Hills, with it’s upmarket shops, manicured lawns and posh houses, Hollywood in comparison was the poor relation. It felt tired and unloved. Tomorrow we move south to Long Beach, not before driving over to Santa Monica and Venice beach.